[Nota: situação em que o fisco dos Estados Unidos (IRS) desconsidera a personalidade jurídica de uma empresa para reclassificá-la como um empregado]. 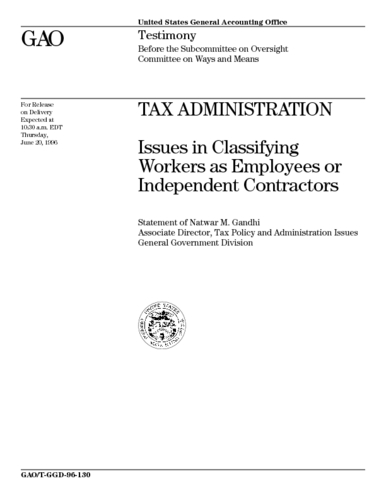 IRS reclassification as an employee occurs where persons claimed as (or claiming to be) independent contractors are recategorized by the Internal Revenue Service (IRS), or by state tax authorities, as W-2 employees. The reclassification can result in the imposition of fines, penalties, and back-taxes for which the employer is generally liable. These amounts could cost a business large sums of money. The U.S. Government Accountability Office (GAO) (formerly known as the General Accounting Office) reports that the IRS claims to lose millions of dollars in uncollected taxes because of misclassification of independent contractors by taxpayers. Clique na imagem para ler o relatório do GAO (TCU americano) sobre o caso.